AvP is part of a growing group of games that I have found myself coming across during my tenure with this site. These are games that are so woefully average that I really don’t have anything to say about them. AvP is a side-scrolling beat em up. You’ve played them. I’ve played them. 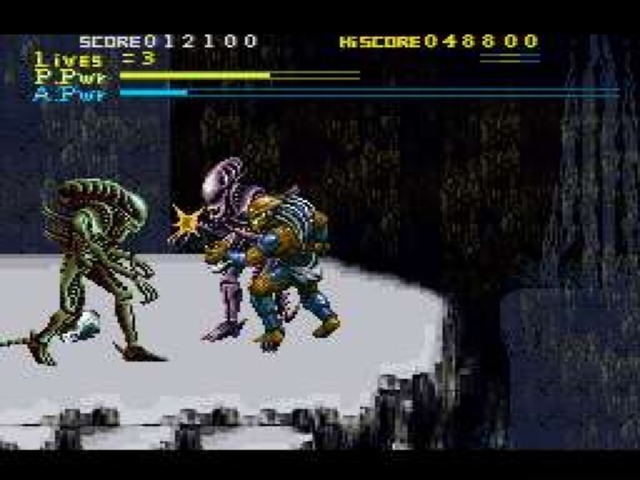 This one has you playing as the Predator, and you beat up Aliens. When you punch a button, you throw a punch. Press another, you jump. If you grew up with these consoles, you’ve played this game a million times already, just with different characters in the starring roles. So I ask you, what is there to say about this game? First of all, this is NOT the game that was featured in the arcades. Capcom, I believe, put out an excellent side scroller to the arcades, with a nearly identical premise. The citizens of a future city find Aliens in their subway tunnels, and the Predators show up to hunt. However, that game was masterful; filled with ingenuity and blood-soaked mayhem. This SNES version, which could only very loosely be called an arcade port, leaves the mayhem behind the quarter slot. Technically, AvP works and has a competent fighting engine. There are no collision detection errors a la Cliffhanger, or truly boneheaded design choices. Its problem is that it’s just so damn bland. The fighting is not intense, and requires no smart thinking and little skill. The sound is stock and unmemorable. Graphically, it’s weak, with a limited color palette and animation that suffers from far too many cut corners. Most of the characters move like marionettes on strings, though the attack movements generally do a decent job of conveying power behind them. The backgrounds are alright, certainly nothing worthy of note. Enemy Aliens are pretty faithful to mythos, and perhaps as a result, lack much creativity at all. The real fault is that playing AvP is a boring experience, which no fighter should ever, ever be. A maximum of three enemies are on screen at one time, and as long as previous side-scroller experience has taught you how to spread your attacks among enemies, or group them together to hit at the same time, this will play out like a mindless exercise. If you don’t feel like fighting, simply kill an enemy, as every single enemy drops a powerup when they die. These are usually projectile Predator weapons which knock an enemy flat in one hit. If you don’t even feel like doing that, you can press the shoulder buttons and do a slide which knocks enemies to the ground. Repeat with alternating left and right slides until all your foes are dead, and you’re walking away without a scratch. You also have unlimited shots with your shoulder cannon, if you don’t even feel like moving. Though I suppose I shouldn’t complain much, as the slides and projectiles represent the only variation in your attacks. It’s hard to call AvP a bad game, as its only glaring fault is that it is an average entry into a bloated genre. However, it is boring, and that is pretty much a show-stopper. There are more modern games that make it a lot more fun to be a Predator, and the excellent arcade version of this title shows what this one could have been. Certainly playable, lets you play as a Predator wailing on Aliens, as advertised. Quite a boring, stale little brawler.